As China continues to embrace its role as a major regional power, its increasing willingness to engage with the Afghan peace process offers an interesting indication to the emerging dynamics of the wider Central Asian region. Having already established considerable influence across large parts of Asia, the Persian Gulf, Africa and even Europe; China with the help of its Belt and Road Initiative has continued to leverage its widespread trade and economic relations for increased diplomatic goodwill, across a diverse range of countries. This has allowed China’s diplomatic relations with these countries to help shape what many have termed as a New World Order, which is directly in contention with the US’s unilateral supremacy. This is perhaps most apparent in China’s increasingly prominent role in Afghanistan, which serves as perhaps the most challenging yet most indicative example of China’s stated objectives of enhanced regional integration and shared prosperity. The key challenge posed by Afghanistan comes to a large extent from the rampant insecurity and instability that has for decades characterized its relations with its neighbors. The impacts of the US led War or Terror (now in its 18th year) has for instance overshadowed many attempts by its neighbors to meaningfully engage in major trade, investment and/or development related activities. Recent statements from the US president regarding the impending withdrawal of US forces have cast even further uncertainty over these issues, specifically due to the lack of a coherent exit strategy from the US. As a result, Afghanistan’s relations with its neighbors such as Iran, Pakistan and China are still weighed down heavily by security related issues. These include issues such as cross-border terrorism, the smuggling of illicit goods and services and the ensuing threats to the safety of foreign citizens residing in and travelling to Afghanistan. The need to address these issues has further come to serve as a major pre-condition to the eventual success of the fast developing China Pakistan Economic Corridor (CPEC) as well as the overarching Belt and Road Initiative (BRI). Especially considering how a key priority of the BRI is to socioeconomically develop the Xinjiang Autonomous region in Western China, there is a definite threat of the myriad security challenges plaguing Afghanistan to spill-over across its border into these areas. 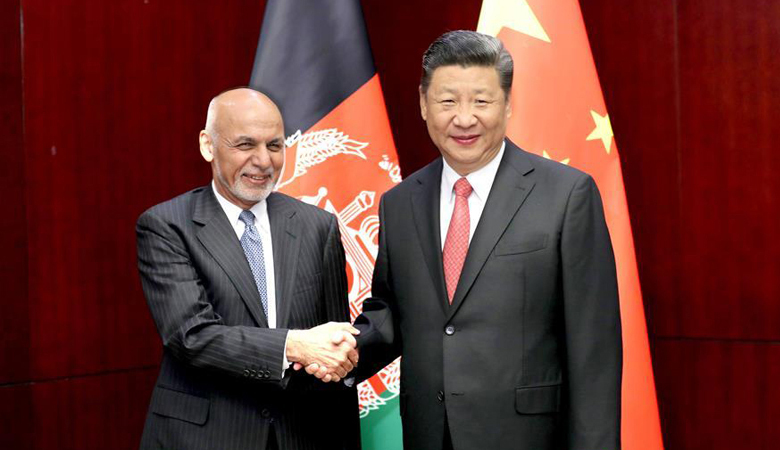 China’s increasing willingness to play a greater role in the Afghan peace process, can thus be understood as emanating to a large extent from its increased stake in the wider region as part of the BRI. Based on this framework, China can be seen leveraging its increasingly close ties with Pakistan, as well as the Central Asian Republics to address the prevailing insecurity within Afghanistan at a more regional level. The recently held meetings between the foreign ministers of China, Pakistan and Afghanistan are indicative of this desire, as China continues to promote dialogue between the two neighbors. Furthermore, according to recent statements made by the Chinese ambassador in Pakistan, China is also working to promote ongoing talks between the Afghan government and the Taliban for which the Chinese government has appointed a special envoy to coordinate with the Taliban’s political office in Doha. In addition to these diplomatic efforts, China is also reported to have ramped up its military cooperation with Afghanistan, providing millions of dollars in aid to the Afghan military. It has sought closer cooperation and military exchanges particularly with respect to counter-terrorism operations. This has even given rise to rumors that China is mulling over setting up a military base in Afghanistan’s Badakshan province, close to the Wakhan Corridor which borders the Xinjiang region. While the Chinese government has officially denied such reports; such a base would purportedly be China’s second overseas military base, further bolstering its capability in projecting power beyond its own borders. Hence, while China’s interests in fostering closer cooperation with Afghanistan are self-proclaimed to be promoting peace and regional stability, these measures have continued to irk the United States adding further tension to already fraught US-China relations. These include the long-standing effects of the ongoing US-China trade war, the increasing militarization of the South China Sea, as well as China’s fast increasing influence across the surrounding region. All of these factors arguably point towards the US’s own unsuccessful attempts at containing the rise of China, which exacerbated by China’s growing role in Afghanistan leads to the growing possibility of China eventually supplanting the US as the dominant power within Central Asia. However, considering the vast array of challenges still facing Afghanistan, and the US’s tenuous hold over the region built over decades of war, the prevailing politico-economic dynamics of the region still remain as complex as ever. Thus, even though China’s increasing focus on Afghanistan is likely to benefit the region as a whole, its most recent efforts are likely to bear fruit only over the long-run. That is also only if China and its surrounding countries remain committed to the overall vision of regional peace and prosperity that is enshrined within the Belt and Road Initiative. Author: Waqas JanThe author is a Research Associate at Strategic Vision Institute (SVI) Islamabad for the China Study & Information Centre (CS & IC).